There is a difference btw the black Endor blaster for awing and imperial gunner. make sure You get the correct one for each.. also hard is the pure black imperial blaster for like storm. 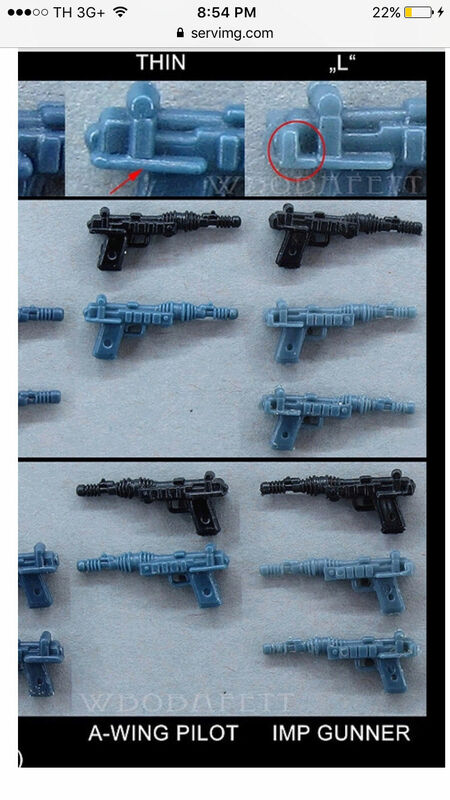 On first reading, the above seemed bizarre to me - why make a slightly different version of the same gun for two figure characters? The only logical answer to me, if this is true, is that both figures were only ever made in one single Far East factory and that both factories were different. That is, the gun mould used for each figure is unique to the factory that made it. I have only had a look on eBay so far, but from the MOCs I looked at, I can see that both figures were made in Hong Kong, but the A-wing pilot was from factory "HN" (aka Smile) and the Imperial Gunner was "HG" (aka Kader). I am curious - does anyone have or has seen these figures with a different factory code on the back of the card? I don't know that it is conclusive proof that only "x" was released with one and "y" with the other. To truly know there would have to be a large pool of the potf cardbacks checked to make sure of the factory codes and looking at the thread there were several but not a large amount checked for confirmation. Of course trilogo cards are a whole different thing and those would not yield any data for confirmation. Trilogo cards were notorious for mispacks and errors and that is where some come from trying to state the luke stormy should have a blue blaster (A whole different topic but you can see how weapon confusion occurs in that line). Bryan, thanks for that link. You must have a brilliant memory to pull this out of the archives so quickly. I know that I'm years too late to the party, but this is still pretty cool stuff and I will keep a keen eye on the moulds used in each of my pick-ups. It would be interesting to see though, if anyone has a made in Taiwan (say) A-wing or Imperial Gunner MOC or indeed any other different factory for that matter. But I have a feeling that Mr Wolf might be right. 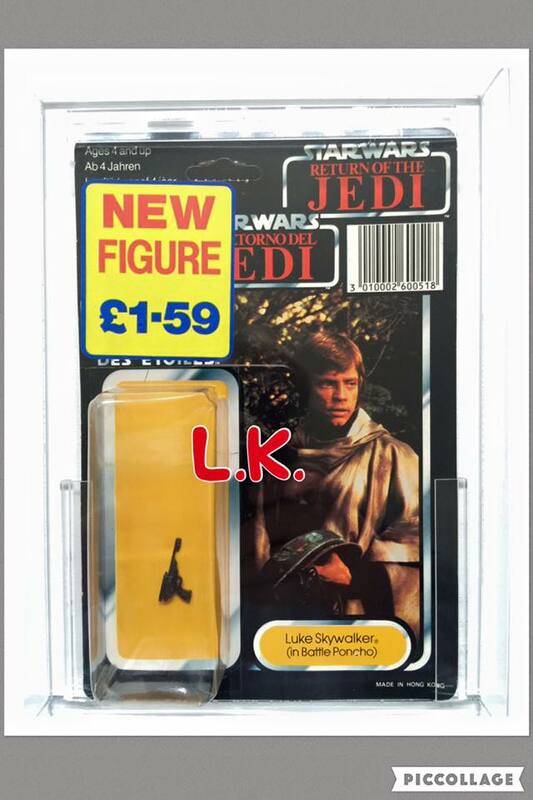 For example, Luke Jedi had 3 factory companies making the figure for Kenner MOC right up to 77backs. After which all Luke Jedis were made by the Taiwan Factory only. So it seems plausible that production was centralised for each other character too. Agree Tri-logos are all over the place - The most commonest Tri-logo Luke Jedis that I have picked-up have been Taiwan COO, yet they never bothered to update the COO which says Hong Kong on the card. Makes me wonder why they bothered putting a COO on the Tri-logo card in the first place. Wolff is generally petty sharp when it comes to these things, but like I said for better confirmation it would be up to carded collectors to check the factory codes on the cardbacks and then share and record the results so a larger pool of cardbacks was checked. Just a funny aside thing on tri logos. The coolest miscard I ever saw was a luke poncho tri logo card that was factory sealed with only the belt and the poncho in the blister. No figure and I dnt recall the gun either. I will try to dig that out so you can see it, was pretty funny to see and consider that it made it to market and someone bought it and kept it all these years. I remembered wrong, it was just the gun and the figure and other accessories are missing. I am told this is real and this was shared with me. Let start a matrix of POTF figures and lets do all 17! If you are reading this thread and have a MOC of any of the POTF figures, can you confirm what the figure has as a factory code on the back - Even better if you have a photo to share (post them in this thread), but if you don't have time then you can just reply with a list of the POTF cardbacks you have and what each factory code is? Used Cardbacks will also be great as the factory code is on the back next to the POP. "Used" - is that the correct word? Bryan - please dig out that Photo of Luke Poncho is crazy! Can you imagine seeing that in a toy shop?